On the 11th (Mon), snap pictures at Howrah Bridge, then enjoy the sand and surf at Laxmanpur Beach, then take a leisurely stroll along Neil Island Jetty, and finally enjoy the sand and surf at Bharatpur Beach. On the 12th (Tue), you'll have a packed day of sightseeing: enjoy the sand and surf at Sitapur Beach and then enjoy the sand and surf at Ram Nagar Beach. To see traveler tips, photos, reviews, and tourist information, you can read our Neil Island online trip itinerary planner . New Delhi to Neil Island is an approximately 8.5-hour flight. You can also drive. Traveling from New Delhi in February, you will find days in Neil Island are somewhat warmer (36°C), and nights are much hotter (28°C). Finish your sightseeing early on the 12th (Tue) to allow enough time to travel to Havelock Island. Kick off your visit on the 13th (Wed): kick back and relax at Elephant Beach and then tour the pleasant surroundings at Radhanagar Beach. Keep things going the next day: head outdoors with Outdoor Activities and then enjoy the sand and surf at Kalapathar Beach. To find ratings, other places to visit, more things to do, and other tourist information, use the Havelock Island driving holiday planner . Use the Route module to find suitable travel options from Neil Island to Havelock Island. 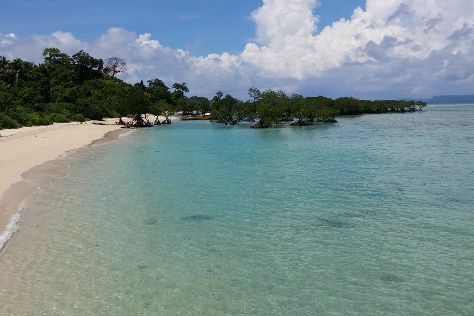 In February, daily temperatures in Havelock Island can reach 36°C, while at night they dip to 28°C. Finish up your sightseeing early on the 14th (Thu) so you can travel to Port Blair. Kick off your visit on the 15th (Fri): enjoy the sand and surf at Munda Pahad Beach, stop by Sagarika Emporium, and then tour the pleasant surroundings at Jogger's Park. On your second day here, stroll through Corbyn's Cove, then enjoy the sand and surf at Ferar Beach, then steep yourself in history at Cellular Jail, and finally appreciate the history behind Rajiv Gandhi's Statue. For where to stay, reviews, more things to do, and more tourist information, read Port Blair trip planner . Traveling by car from Havelock Island to Port Blair takes 3.5 hours. Traveling from Havelock Island in February, you can expect nighttime temperatures to be a bit warmer in Port Blair, with lows of 32°C. Wrap up your sightseeing on the 16th (Sat) to allow time to travel back home.